When Georges Perec was 11, he decided to wander. In fact, escape is perhaps a better way of describing it; a jailbreak from his Aunt’s house in Rue de l’Assomption to wander Paris with who knows what planned other than avoiding school. It was such a defining experience for the writer that he later composed a text surrounding the feelings and places he encountered on this lost meander called Les Lieux d’Une Fugue, later published posthumously in the volume Je Suis Né in 1990. The text was translated as The Scene of a Flight quite recently in the Penguin volume of Species of Space and Other Pieces but, most intriguingly, the text appears in a film that Perec made in 1978 only a few years before he died. This forty minute film version contains the majority of the text and finds Perec behind the camera, something he was clearly itching to do at this point. That same year he was filmed by a Television crew stating such a desire while on set for Alain Corneau’s Série Noire, the speed and money admittedly also playing into his growing love for working in films as opposed to simply novels (he had, after all, just finished work on the huge Life: A User’s Manuel). The film was fully funded by the Institut national de l’audiovisuel and Perec seems to have had full freedom to explore a visual response to his own text. Such is its experimental nature, it feels not unlike Alain Resnais’ early documentary films. The cinematic medium also gives the writer a chance to experiment with the audio-visual potential of a fugue itself, intertwining explorations of place, memory and voice-over with the music of Schumann in overlapping moments of emphasis. The writer’s story is a melancholic one, the perception being overtly that of an orphan lost in the city. He has little money to enact his plan, spending most of it on some milk-bread and a comic. The piece (and the film) opens with plans to sell his stamp collection, the detail belying Perec’s typical collector’s sense of detail; something that cannot be faked. However, all is not well. The stamp collectors usually sat at the market trading in their small, travelled wares are absent on the day. 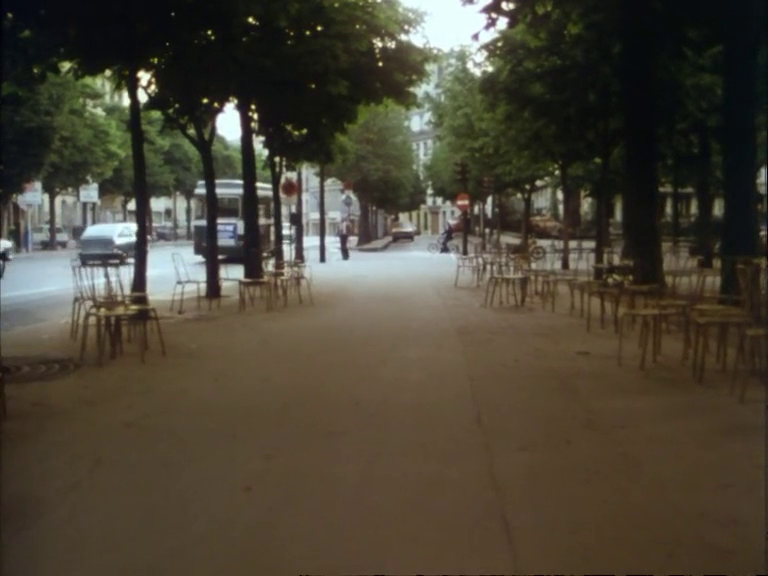 Perec in the film version especially captures beautifully that early morning hum of a city slowly waking up. People are absent with the exception of the street cleaners. He is more alone in these streets than usual, or at least that is the perception gleaned. That day all of those years back seems to have almost scarred the writer though the account is more complicated because nothing necessarily bad happens to him. This is really concerning the death of his parents in the war, his mother especially who disappeared and is assumed to have died in Auschwitz. Young Perec gets lost around central Paris, far away from his Aunt’s house in arrondissment 16 but he is lost before he steps out of the door. He seems reluctant to allow for help from policemen and metro ticket inspectors, only eventually giving in to actually savour the feeling of being missed or wanted. In the film, he begins with a doorway, slowly tracking back. Every element is noted by the camera with an ease I imagine the writer to be envious of. His pages and pages of text, mapping the perception of even the simplest place, swapped over for a single, smooth visual that does the same thing more efficiently. The rest of the film also contains these patient qualities, as if Perec is daring himself to revisit yet again an experience that terrified him and shaped him in ways that are only hinted at, undercurrents that sit between each sentence of his short prose work. The day has a clear lineage with his own future creativity. His obsessions with objects and paraphernalia of all kinds acting as an escape seems an extension of his childhood self here, only instead of being disappointed by the lack of stamp sellers on the Champs-Élysées, he creates his own worlds. The everyday scenario is collected, marked, catalogued, maintained, itemised and retained for future trading with his readers. There will always be people around him in his fiction to show his curios to. He will never be the lonely child. What was he running away from that day? Loneliness? The tedium of school for a meandering mind? It could even have been his Aunt but equally it could be the loss of his parents and the sense of dislocation allowing to drift all over Paris in a way Guy Debord could never quite match in earnest; running away without destination and with home only present in the official sense alone, tragically no longer in the emotional sense.